The Plein Air Latex Pillow is one of three pillows made by Berekley Ergonomics (BE). The other two are the Gümmi Pillow and the Organic Wool Pillow. They are listed in the Bedding section of the BE website. According to Berkeley Ergonomics, these are made with "European quality" and the values BE believes in. The Plein is a latex pillow. Its key feature is the zoning of the support core. The pinholes in the middle are larger to make it softer. The firmer latex with the smaller pinholes surrounding this "halo" support the neck regardless of the angle in which the pillow is used. According to BE, the zones in the pillow core are molded to fit the neck and head of the customer. 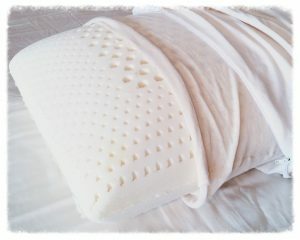 This core is made of Talalay latex consisting of 100% natural latex. This product of rubber tree sap is naturally resilient, cushioningly supportive. Natural latex is also resistant to nusiance microbes, such as bacteria, fungi, and dust mites. Latex is breathable, and is also known for its pressure relief. Unlike feather or down pillows, latex retains its shape. The cover of the Plein Air Latex Pillow is a stretch-knit fabric made of 100% organic cotton. It is zippered so it can be removed for machine washing and tumble drying. The Plein Air Latex Pillow also comes with its own pillow case. This is a sateen fabric, made of 300 count organic Egyptian long-staple cotton. Berkeley Ergonomics states that this pillow is free from harmful chemicals, and is certified by the Oeko-Tex 100 standards. The Plein Air Latex Pillow is available in stores selling Berkeley Ergonomics mattresses and bedding, such as Design Sleep. It is available in Queen size (20" x 29") with a choice of firmness level (medium or firm). I did not find a warranty for the pillows, so I'll assume it is the same as Berkeley Ergonomics' 10-year warranty on the mattresses.